Replacement: None. We are no longer carrying this shield in our catalog. This page is for reference only. Power line communications technology is a way of carrying data on a conductor that can also used for power transmission. You can use it to pass a control signal through the electrical wiring in a house for home automation. LinkSprite's Mamba shield gives your Arduino this ability. 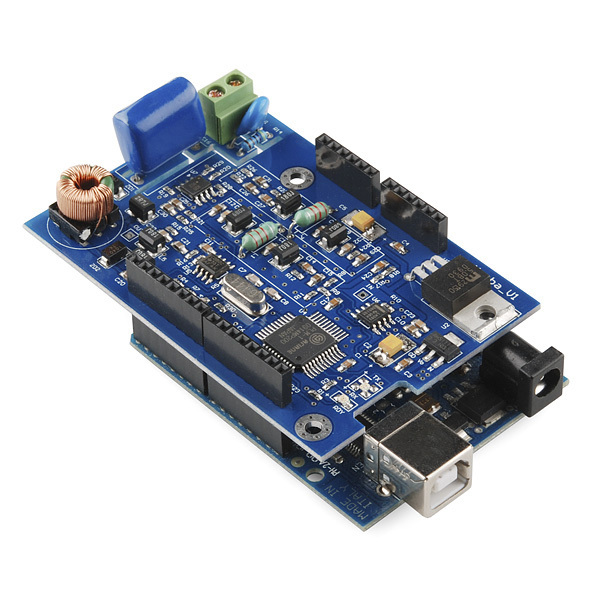 This Narrowband Powerline Communication shield can be controlled by your Arduino board using a simple SPI interface. Now you can take advantage of your house wiring instead of relying on a complex mesh network for home automation of data acquisition. Note: You will need to supply at least 1Amp for the shield to function correctly. As this product is now retired, is there a similar, new product available? This is exactly what I am looking for. I bought three shields for a project I'm doing for university and they're working well. The data transmitted from one shield is received by all other shields and there is a built in collision detection system which is handy. I'm kinda bummed that the example code only works with the alpha 22 IDE rather than the latest 1.0.3 IDE. Sorry to be "that guy", but where's the Eagle file? 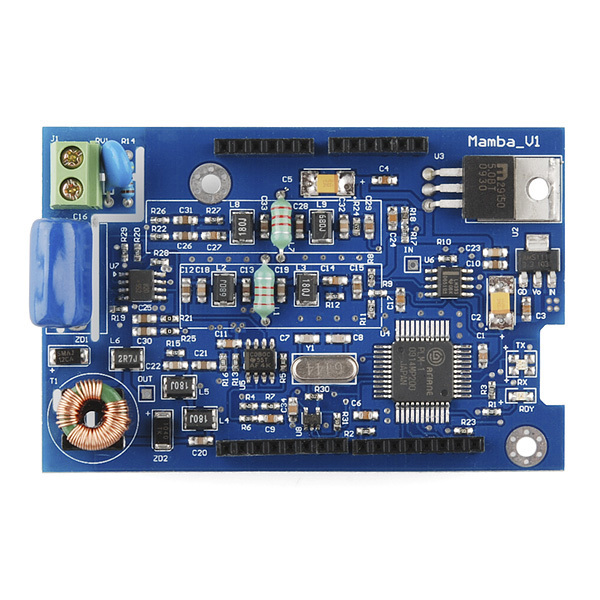 Recently I've bought two Mamba Shield to connect with two Arduino Uno with the intention of transmit data through a DC line. It's the first time that I use a powerline communication. This is a technical matter. I need help to start working with them. Until now I've not had success because I have not any idea of how to connect the devices among them. I am searching information in Internet but it does not exit very much. My aim is transmit data using 12V lines of a battery. The library code compiles well. 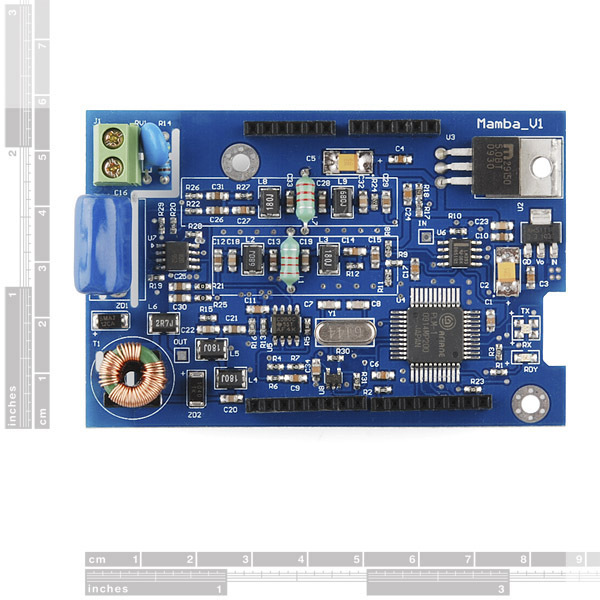 How I should modify this code to transmit data to the other Mamba? Any picture or code demonstration could help me a lot. I bought 2 of these got them working without a hitch on 2 Unos. Now I am trying to use 2 Megas; Should this be possible? There is a notch on the Mamba to allow it to sit properly on the board without being clipped by the Mega's USB connector, which seems like a good sign; I've also edited the sketch to use pin 20/21 for MISO/SCK, and left the rest as is - But the RDY light never comes on. Do I need to change the MOSI pin to something other than 3? Any ideas what might need to change otherwise? Thanks for your help! Can i set up several of this, communicating "simultaniously" in both directions (rx/tx) without the need of any awkward synchronisation? Is this possible at all? I love the concept but cannot find much on Mamba. I have several Insteon devices in my house and would love to be able to interface with these using Arduino based devices or vice versa. 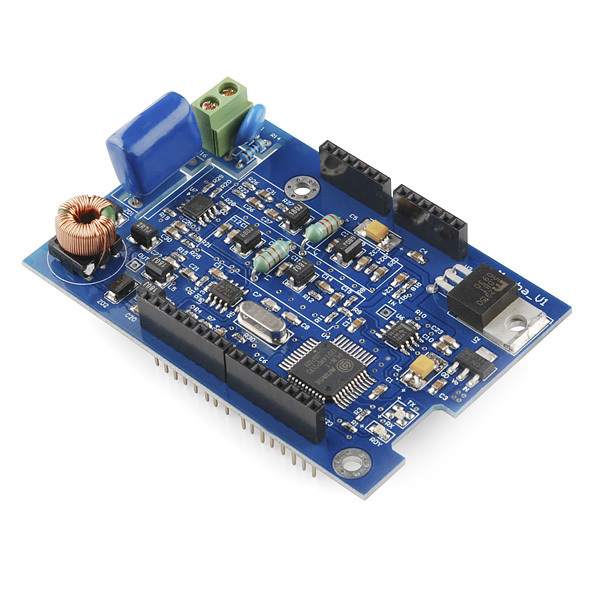 But with what I've seen so far, it's a $110 cost to have two Aruduino's communicate with each other. Another note....many houses are split into two phases. 240V coming into the house is 2 - 120V legs. To use power line communications, you need to have a device to pass the signal from one phase to another. I installed a dedicated 240V circuit breaker to do this with a device for the Insteon product. If Mamba does not have something for this, you may find that you cannot communicate with the device you'd like to because it is running on a different phase. Does this work on Australian power lines? Does this play nice with Powerline Ethernet products? I was just reading Anandtech's review of same, and it seems like a wild west interference nightmare out there. 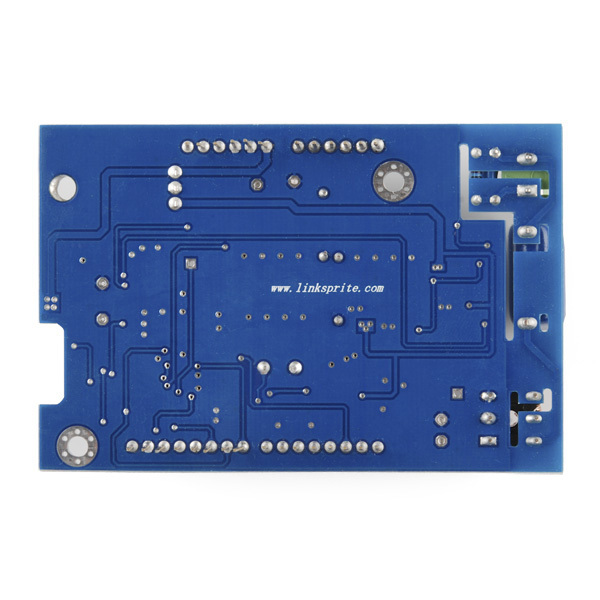 LinkSprite's Mamba shield gives your Arduino the ability that very ability.